For the 1974 musical film starring Lucille Ball, see Mame (film). Auntie Mame is a 1958 Technicolor comedy film based on the 1955 novel of the same name by Patrick Dennis and its theatrical adaptation by Jerome Lawrence and Robert Edwin Lee. 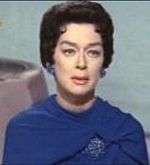 This film version stars Rosalind Russell and was directed by Morton DaCosta. Mame, a musical version of the story, appeared on Broadway in 1966 and was later made into a 1974 film Mame starring Lucille Ball as the title character. Patrick Dennis (Jan Handzlik), orphaned in 1928 when his father unexpectedly dies, is placed in the care of Mame Dennis (Rosalind Russell), his father's sister in Manhattan. Mame is a flamboyant, exuberant woman, who hosts frequent parties with eclectic, bohemian guests. Patrick is quickly introduced to his aunt's free-spirited and eccentric lifestyle, including Vera Charles (Coral Browne), a Broadway actress, who spends many of her nights passed out drunk in Mame's guest room. Mame's frequently repeated motto is "Life is a banquet, and most poor suckers are starving to death!" Since Patrick's father was a wealthy man at the time of his death, Patrick's inheritance comes with a trustee, Mr. Dwight Babcock (Fred Clark). Mr. Babcock disapproves of Mame's lifestyle (as did her brother Edwin) and wants to interject decorum and discipline in Patrick's life. Mame has Patrick enrolled at a progressive school run by a friend of hers, Acacius Page (Henry Brandon). Mr. Babcock insists that Patrick be enrolled at Bixby's, a nearby boy's prep school. When he finds out that Mame has not enrolled Patrick at Bixby's, he issues an order: Patrick is to go to St. Boniface boarding school and Mame will only see him at the holidays and during the summer, which is what his father wanted in the first place. When Mame's investments are lost in the stock market crash of 1929, she takes a series of jobs—stage acting, telephone operator, sales girl at Macy's—that all end disastrously. At her sales job at Macy's, she meets a man named Beauregard Burnside (Forrest Tucker), a rich oil man from the South. He's immediately smitten with her and she falls in love with him as well, and he proposes to her on the spot in front of his family at their estate in Georgia. For their honeymoon, Beau and Mame travel around the world. Though Mame is sad about leaving Patrick, they keep in touch through letters and frequent visits during holidays. Through their correspondence, Mame gets a sense that Patrick is growing into a stuffy, conventional man, and she worries for him. When Beau dies while they are climbing the Matterhorn, Mame comes home. Patrick surprises her by installing a dictating machine and a secretary, Agnes Gooch (Peggy Cass), for her convenience. He and her friends persuade her to write her autobiography. Patrick and Lindsay Woolsey (Patric Knowles), a friend of Mame's, arrange for a collaborator (and ghost writer) for Mame, Brian O'Bannion (Robin Hughes). He is initially charming and Mame is smitten, however it soon becomes clear that O'Bannion is a hack and using Mame as a meal ticket; Mame dictates her life to Agnes and both of them are hard at work on her autobiography, while O'Bannion does nothing but eat and take advantage of Mame's generosity. One day, as he attempts to become romantic with Mame (who wants nothing to do with him at this point), Patrick walks in on them and disapproves. He announces that he has a girlfriend, Gloria Upson (Joanna Barnes), and wants to bring her over to meet Mame. He cautions Mame to act responsibly while Gloria is there. She calls him beastly and he almost leaves, but at the last minute Mame says she will do whatever he wants to make him and Gloria happy. Patrick thanks her for agreeing to behave and leaves to bring Gloria. Meanwhile, O'Bannion insists Mame get dressed for a party to meet movie producers interested in Mame's autobiography. Mame instead dresses the dowdy Agnes up and tells O'Bannion that Agnes is an heiress merely doing secretarial work for "life experience." O'Bannion's greed kicks in and he escorts Agnes to the party in Mame's place. When Agnes returns the next day, she is disheveled and remembers very little of her night with O'Bannion—only that she drank heavily and thinks she saw a movie with a wedding scene in it. Patrick brings Gloria over, but Mame is horrified to see she is nothing more than a spoiled rich girl, pretentious and completely lacking in substance. Against Patrick's wishes, she goes to visit Gloria's family in a Connecticut gated community, where they express anti-Semitic views. Her parents (Lee Patrick and Willard Waterman), although outwardly friendly, are just like Gloria, and Mame finds them repulsive. Mame arranges a dinner party at her apartment and she invites Gloria, her parents, and a few of her own eccentric friends. On the night of the party, Patrick meets Pegeen (Pippa Scott), Mame's new secretary—Agnes is now several months pregnant due to her night with O'Bannion and staying with Mame in "her friendless condition." Everything about the evening is a carefully planned disaster: the food, the drink, the furniture, and the company. Lindsay surprises the attendees with the galleys from Mame's autobiography; the ribald content leads Gloria to insult the other attendees; Patrick defends them, attacking Gloria's friends instead. In a bizarre twist, the release of the book prompts a telegram from O'Bannion, demanding his efforts be rewarded, and announcing that Agnes is his wife and can substantiate his claims. The evening ends with Babcock insulting and demeaning Mame, but Mame is unfazed and responds in her typical witty manner. Cut to several years later, where Patrick and Pegeen are now married. Patrick and Pegeen's son Michael wants to travel with Mame on her trip to India. The two of them wear down Patrick and Pegeen's objections, and the movie fades away as Mame tells Michael of all the wondrous sights they will see. Best Motion Picture: Warner Bros. This film was the #1 moneymaker of 1959, earning a net profit of $8,800,000. 1 2 Crowther, Bosley (December 5, 1958). "Auntie Mame (1958) Screen: 'Auntie Mame'". The New York Times. ↑ "Oscars.org – Auntie Mame". Academy of Motion Picture Arts and Sciences. Retrieved December 11, 2013. ↑ "AFI's 100 Years...100 Laughs" (PDF). American Film Institute. Retrieved August 21, 2016. ↑ "AFI's 100 Years...100 Movie Quotes" (PDF). American Film Institute. Retrieved August 21, 2016. 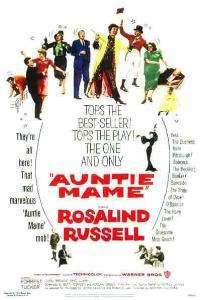 Wikimedia Commons has media related to Auntie Mame (film).